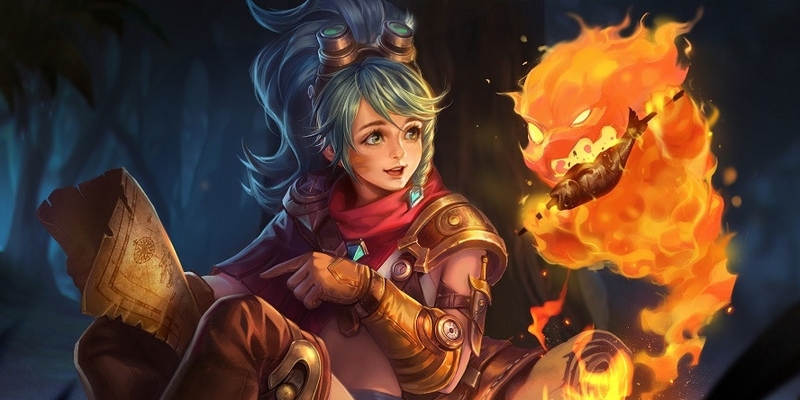 A guide for Arena of Valor's Roxie, the Adventurer. Roxie rushes around the battlefield on her rollerskates, leaving a trail of fire in her wake to burn any who would dare chase her or unlucky enough to be caught by her pal Agnie. Roxie is a Warrior/Tank hero who damages heroes through a trial of fire she leaves behind her. She is a powerful initiator and area deny specialist, sweeping into enemy teams to grab a high priority target and drag them back to her waiting team mates. Great Area Denial – Roxie’s unique gameplay allows her many ways to assist or protect her team. The flames that she leaves behind are a natural deterrant, allowing Roxie to either force enemies to constantly shift on the battlefield, give up on chasing weak allies early, or fight in unfavorable places. Intiation– Her ultimate, Agnie’s Grasp, is a fantastic tool for starting fights or ganks. Grab an enemy, turn on your flames, and drag the helpless opponent back toward your team. No Forward Range– The only tool she has for dealing with enemies from a distance is Wild Fire. Even then, this only leaves fire in a trail behind Roxie, making it very easy for enemies to anticipate. A Roxie player will have to be very clever to properly use her abilities. Team Dependent– Roxie will generally be unable to finish targets off by herself, even when focusing on building damage. The tank works much better as a support and will consequentially sport a much higher assist score than kill score in most games. Roxie can head either to the Dark Slayer lane to play solo or to the Abyssal Dragon lane to play as a roaming support. Her kit allows for both effective farming with Wild Fire and ganking with Agnie’s Grasp, making either a viable strategy. If alone, cover the minion wave with Wild Fire to assist in farming as well as discourage your opponent from approaching. Use Blazing Shield to escape from any enemies who might try to gank or from your opponent’s harassment. It should not be used aggressively until later in the game when Roxie has a few items to keep her alive. Don’t completely rely on Wild Fire to clear the wave, as Roxie will need to restore mana through normal attacks as often as possible. Always focus on maxing Wild Fire first. The damage it offers will both help Roxie farm in the lane and support her teammates in fights. As per usual, take ranks in her ultimate, Agnie’s Grasp, whenever possible. While not the most impressive while alone, the ability is invaluable in ganks and team fights. Roxie will lead the charge in ganks, getting up close to the target with Blazing Shield, hooking them with Agnie’s Grasp, and activating Wild Fire as she drags them back to her allies. If the enemy is still alive after Agnie’s Grasp has ended, cut off their escape with flames from Wild Fire. Roxie is not great at solo fighting. Get a few hits on them to activate Fire Spirit while Wild Fire is activated before trying to burn down their health with Wild Fire. If possible, use Agnie’s Grasp to drag the target under a turret and force them to take a few hits from the structure. Roxie’s job in a team fight is to find a squishy target and drag them out into the open with Agnie’s Grasp, burning them all the while with Wild Fire. If successful, try and spread your flames around the battlefield, using Blazing Shield for a bit of additional movement speed and survivability, stopping to attack enemies to apply Fire Spirit whenever possible, as Roxie needs all the mana she can get. Keep Wild Fire active while escaping if able. The flames will discourage enemies from chasing and punish any who try to anyway. Blazing Shield is Roxie’s best bet when wanting to escape, the additional movement speed it offers great for putting space in between yourself and your opponent. It additionally provides a shield to help the girl survive as she bravely runs away. Fire Spirit – Passive – Every 40 maximum HP grants Roxie 1 ability power. On every 3rd normal attack, her mana is restored by 8% and Agnie puts a mark on the target that lasts for 5 seconds. Attack as many separate units as you can in large fights to maximize the amount of health gained from Wild Fire. More marked units equals more health restored. Don’t forget to normal attack in fights, as the mana regeneration Roxie gets directly through the passive and the health regeneration she receives through Wild Fire can be a big help in team fights. Wild Fire – Roxie’s boots are infused with the spirit of fire while consuming mana, and flames ignite under Roxie’s feet as she walks. Each flame lasts 2.5 seconds and deals 20/26/32/38/44/50 (+0.16 AP) magic damage every 0.5 seconds to targets nearby (stacks up to 3 times.) If an enemy is marked by Agnie, Roxie’s health is restored by 1% of HP she lost (2% if the target is an enemy hero), but this effect does not stack. Wild Fire is Roxie’s main damaging ability and should be used as often as possible in fights. Given Wild Fire’s constant upkeep cost, the Sage buff can be invaluable to Roxie, especially later in the game. While it might be tempting to spread the fire out as much as possible, bunching it together will allow multiple instances of the flames to affect single targets. As such the ability is still useful even when fighting in a single location. Blazing Shield – Roxie gains 25% movement speed and a flame shield that absorbs 150/200/250/300/350/400 (+6% of her maximum HP) damage and lasts for 3 seconds. The movement speed of enemies who come into contact with Roxie while her shield is active is reduced by 50% for 2 seconds. Use Blazing Shield as often as possible in team fights to pad your life out as much as possible. Always consider how you are going to use Blazing Shield when initiating. Do you want to use it to get to the target quickly or to pull them further out of position? Agnie’s Grasp – Agnie reaches out, marks, and pulls the first target it touches toward itself for 1.5 – 2.5 seconds (the closer it is, the longer the duration), dragging the target along as Roxie moves. The cooldowns for Wild Fire and Blazing Shield are immediately reset. While being dragged, the target ignores obstacles and is immune to other control effects. The target also takes 40/60/80 + (+4/5/6% of target’s current HP) magic damage. Even if not needing to displace the enemy, Agnie’s Grasp can be used as a long stun in team fights. Agnie’s Grasp cannot be cleansed or shortened by resistance. Roxie has a very limited range and therefore is weak to ranged attacks, especially from the front. A mage or marksman who can keep their distance from the girl will find her helpless to defend herself. Roxie’s main source of damage is the trail left by Wild Fire. Do all you can to avoid standing in the flames and don’t chase her when she flees. A standard tank build with some extra focus on physical teams. The Aegis and Mail of Pain work together to heavily punish marksmen and other ranged attackers from engaging with Roxie, helping patch up her vulnerability to ranged attackers. The two items also lend significant amounts of armor for all other cases, combining with the magic defense from Gaia’s Standard and the health bonuses that most of the items present offer to make Roxie exceptionally durable. Soaring Aura gives a bit of offensive bite to the build to help Roxie damage foes and keep her from being too easy to ignore as the game goes late. While not able to do much to tear down tanks, Roxie will generally be tanky enough to survive whatever they through out. Use Wild Fire to try and whittle the tank’s health away and rope them away from their team. Warriors will be more vulnerable to Roxie’s fire trail but more able to tear her down in returns. Try to avoid direct confrontation and instead focus on wearing them down with fire. The more mobile the assassin is, the more important it is for Roxie to grab them with Agnie’s Grasp. The completely lockdown that it offers will both prevent them from escaping and from tearing down squishy teammates. Another high priority target, mages are a much bigger threat to her allies than to Roxie herself. Get close with Blazing Shield and hook them with Agnie’s Grasp to shut down their damage and leave them vulnerable to attack. You want mages to attack you over your allies, so build magic defense and try to lure to you in bigger fights. Similar to mages, marksmen are high priority targets who should be the first person that Roxie tries to latch onto in fights. Armor is your main answer to their damage, needing some to ensure that you can approach without falling yourself. Use Agnie’s Grasp on marksmen whenever possible, dragging them through Wild Fire and into your team. Supports will be low priority to Roxie, they mainly nusiances that can make it difficult for her to reach her targets. They are best ignored until damage dealers are down.